12 DB core complexes R +L 15/20 ea. 9 DB core complexes R+L 15/20 ea. 6 DB core complexes R+L 15/20 ea. 3 DB core complexes R+L 15/20 ea. 12 DB core complexes R+L 15/20 ea. Replace the first part of the complex (the ground to OH) of the DB core complex with the burpee ground to OH version. HERE is a demo. Do the unilateral hang clean and shoulder to OH as normal. This whole week has been a core week. Unilateral moves are excellent for pre-hab and shaping. Candice was a sweaty mess after testing. Please let us know how it left you. IF you want more out of this workout, don't jog the run. A DB complex is only complete if you've worked on both sides (L+R). Special thanks to Candice B. for this unique new core workout. 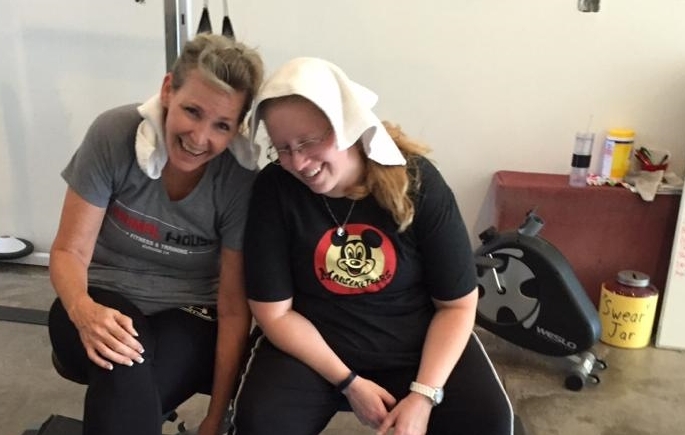 The ladies at Animal House Fitness (GPP Durham, CA) doin' time! If you are in the Durham, California area, be sure to look up LeeAnn and Jonathan. Quality peeps!